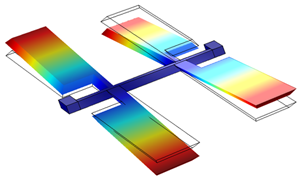 Here are some examples of our COMSOL Multiphysics simulation projects. Figure 1: The Butterfly gyro sense mode. Figure 2: Optimization of coil system for AC Susceptometry. Figure 3: Charge separation in conductive liquid flowing through a magnetic field. Acreo Swedish ICT AB provides contract research and development as well as research-based consulting in areas relating to sensor systems and the life sciences. Engineers and scientists at our company use their knowledge and experience in theory and practice to assist your design workflow. We support the complete product and development life cycle, from basic research and business services to putting together the final product. 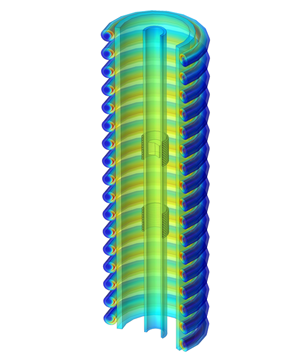 With simulation, we use our iterative and innovative processes to obtain a basic understanding of the design and get objective measurements. Such acquired knowledge not only serves as a guide for cost-effective decision making, but it can also often be condensed for patent applications. 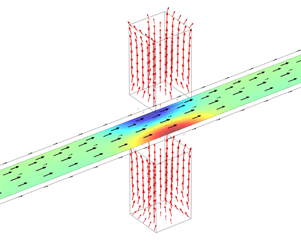 The assignments we take on typically involve true multiphysics problems, where a combination of different physical phenomena are analyzed. We have, for example, experience in coupling solid mechanics, electromagnetics, fluid flow, and heat. We can adapt, have the competence, and encourage following the Design for Six Sigma methodology, as well as agile project management (i.e., SCRUM) in system design development.